Norma: I've written it myself. It's taken me years. It's going to be a very important picture.Joe: It looks like enough for six important pictures.Norma: It's the story of Salomé. I think I'll have de Mille direct it.Joe: De Mille!? Uh-huh.Norma: We made a lot of pictures together.Joe: And you'll play Salomé?Norma: Who else?Joe: I'm only asking. I didn't know you were planning a comeback.Norma: I hate that word! It's return! A return to all those who have never forgiven me for deserting the screen.Joe: Fair enough. Comeback versus return. On the face of it, what's the difference? For Norma the difference is clear: a return is a response, in effect, an acknowledgment of a debt owed to those who have otherwise not forgiven her for the withdrawal of her presence, her desertion of the field of the visual. A comeback, by contrast, involves no such acknowledgment. It appears to be utterly narcissistic, utterly scripted. Whether tenable in the long run or not, what strikes me as useful about this distinction is that it cues us to a subtlety that calls out for attention when we are thinking about the contemporary theoretical status of the voice. How, in other words, should we think about the resurgence of scholarly interest in the topic? Or, put differently, what do those involved in this resurgence think they are doing? Is this the voice's comeback or its return? Or is it something else altogether? Moreover, is the difference here yet another way to approach the problem of residualism? This may seem like an odd place to begin, especially to begin what is conceived as an examination of the relation between philosophy and radio, so allow me to explain. Certainly one way to think about what I have called the "resurgence" of interest in the voice is to grasp it as part of a response to the waning of poststructuralism, or, more precisely, to the attenuation of the critique of "phonocentrism." Although many have jumped onto the bandwagon of this critique, it was put in play with exemplary rigor by the late Jacques Derrida. In its emergent formulations this critique sought to draw out the consequences of the collaboration between Saussurean linguistics and Husserlean phenomenology. Specifically, Derrida found in Husserl's fuzzy and ultimately untenable distinction between expression and indication the same ambivalence to be found in Saussure's risky reduction of the signifier to an acoustic image (literally, image acoustique), that is, an entity devoid of all physicality yet capable of yoking together something seen and something heard. Recognizing this allowed Derrida, through the distinctly French pun on the heteronymic word entendre (that is, "to hear" and "to understand"), to tease out the centuries-old open secret of the essential link between the voice and meaning. The fact that this insight derives from a heteronym, a word whose written or spoken signifier produces two apparently different signifieds, is interesting but does not merit further elaboration here. In the opening section of Of Grammatology Derrida fastened phonocentrism not only to logocentrism but also to ethnocentrism, arguing that logocentrism is "nothing but the most original and powerful ethnocentrism" (3). Once in place and taken up by those interpellated by the grammatological project, the voice became untouchable. To engage the voice, perhaps even to pronounce it, was understood to consign one to an ethnocentrism that, in the sixties, was under siege in every corner of the decolonizing globe, most conspicuously, perhaps, in Vietnam. Indeed, an entire, carefully cultivated rhetoric of the voice as the very embodiment of revolutionary agency was suddenly and fundamentally challenged. It was as though Derrida had discovered, a decade before Foucault, the "repressive hypothesis," not in the vow, but in the voice itself. In a wide-ranging, cross-cultural, and transhistorical assessment, John Mowitt examines radio’s central place in the history of twentieth-century critical theory. A communication apparatus that was a founding technology of twentieth-century mass culture, radio drew the attention of theoretical and philosophical writers such as Jean-Paul Sartre, Walter Benjamin, Jacques Lacan, and Frantz Fanon, who used it as a means to disseminate their ideas. 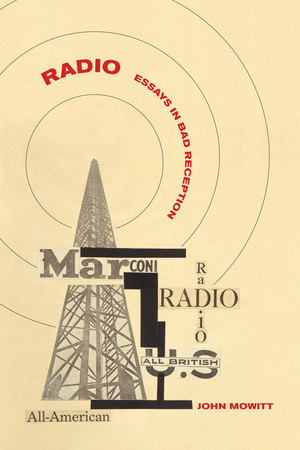 For others, such as Martin Heidegger, Theodor Adorno, and Raymond Williams, radio served as an object of urgent reflection. Mowitt considers how the radio came to matter, especially politically, to phenomenology, existentialism, Hegelian Marxism, anticolonialism, psychoanalysis, and cultural studies. The first systematic examination of the relationship between philosophy and radio, this provocative work also offers a fresh perspective on the role this technology plays today. John Mowitt is Professor of Cultural Studies and Comparative Literature at the University of Minnesota. His previous books include Re-takes: Postcoloniality and Foreign Film Language and Percussion: Drumming, Beating, and Striking. 6. “We Are the Word”?